REBEL BABEL ENSEMBLE is an international, unlimited Big Band that performs on all over the world inviting artists from local orchestras and big-bands. Within 3 years we met more than 10.000 musicians. Meetings and workshops are base for preparation concerts at the biggest festivals as well as crazy performances combining live music with the sounds of nature or technology. Our idea is to build dialogue and understanding through music as well as fulfilling the dreams of young musicians by creating educational and stage meetings for them with pros and great format stars. REBEL BABEL is an experimental, innovative team, which engages and invites various musicians, moving important social problems. We combine contemporary music with local traditional music, high culture with street culture. We join musicians, singers and composers from different regions, crossing their cultures and languages in the musical and verbal meaning. A collective of professionals crosses The world organizing surreal performances, micro and macroconcerts creating new branches in other regions. John Feat. (Jan Eleński) – born in 1984 in Ronne, Danish composer and performer of Polish descent. Graduate of Conservatorium van Amsterdam (drums). He grew up in Wroclaw and afterwards in 1992-2009 because of his father’s engineer contracts he travelled through Europe living in Germany, Netherlands and UK. He performed series of avant-garde acts on the streets of many European cities joining local brass bands as an instrumentalist with cymbals. Since 2012 together with a group of ornithologists he’s conducted a series of therapeutic sound installations which aim is to provide sounds of exotic birds in silent winter parks of Eastern Europe. In 2013 he began cooperation with Institute B61 from Torun and naming himself USB he gave a dozen performances in Baltic Republic titled “Everything is Just a Memory Flash” creating a Macro USB drive from elements of public space. It was his grandfather, bandleader of Galician orchestra who inspired Feat to explore the culture and sound of brass bands. 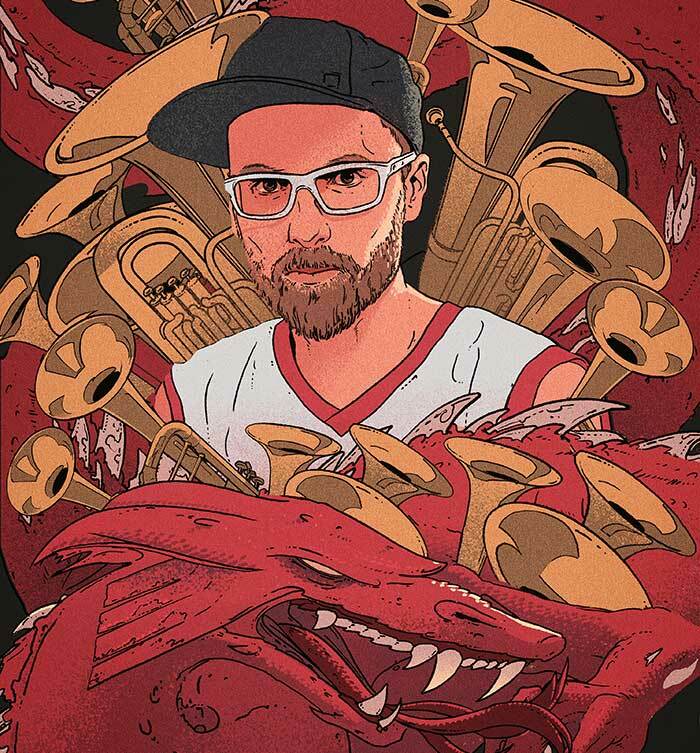 At the same time he has been fascinated by funk and hip hop and that is why, trying to restore and cultivate tradition of orchestras, since 2013 he writes and plays with them modern music situated between pop, funk and hip-hop (for example concerts with Lisbon Orchestra Bombeiros and Original Bandalheira). In 2015 he established in Wroclaw Rebel Babel Ensemble - an unique international and multilanguage orchestra of brass bands gathering musicians and composers from various regions of Europe in order to create a dialogue and to improve everyday reality with music. Ensemble performs various musical acts in all kinds of spaces and circumstances and it’s aiming to be the world’s biggest band. This project is being held under Wroclaw ECOC 2016 patronage. L.U.C (Łukasz Rostkowski) - repeatedly appreciated polish producer, music composer, performer, songwriter, concert and video director, called by polish press an artist of XXI century. For his innovativeness, eclecticism spirit, unconventional music and text solutions he gained respect among many journalists and as a result he got excellent reviews in the most important polish cultural magazines. Certified lawyer who had passed the advocate applications exam and resigned for music. 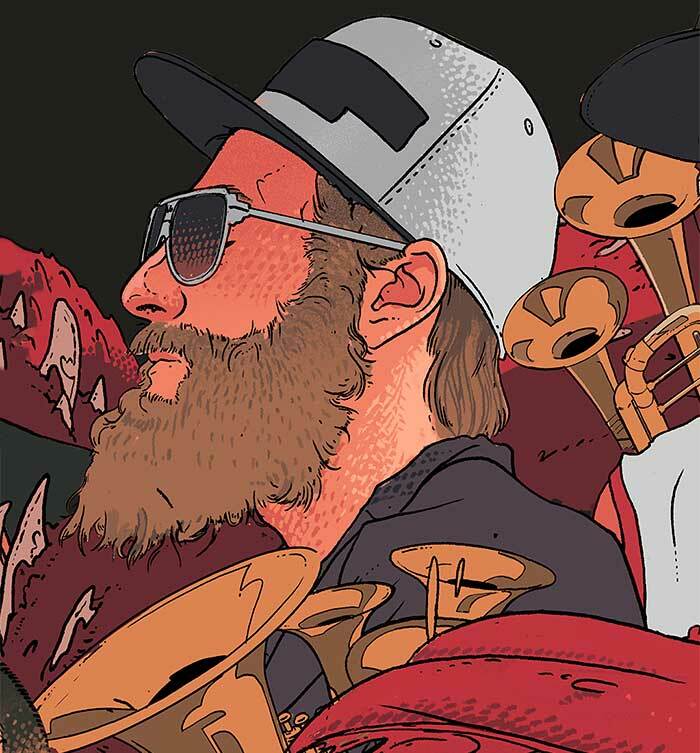 Since 2002 he has recorded 12 LP albums and many soundtracks, spectacles and video's which combines nu jazz, trip-hop, hip-hop with the classical music and electronica. Merging music with the picture is his great passion. In 2004 he created the philosophy of 4 galaxies which connects music, lyrics, movie and graphics in a whole transfer. In 2015, with Jan Feat he founded REBEL BABEL ENSEMBLE - a transcultural, international Big Band, where he met several thousands of musicians from all over Europe. For these works, but also for his inventiveness concert shows, original performances and educational valuable projects he was awarded and nominated to many main polish cultural awards (POLISH MUSIC ACADEMY AWARD FRYDREYK '05'07'08, PASZPORTY POLITYKI, GWARANCJE TVP KULTURY, YACH, WARTO, WROCŁAW MUSIC AWARD). He was producing and recording with many great instrumentalists and vocalists i.e. with famous jazz vocalist Urszula Dudziak, ZBIGNIEW NAMYSŁOWSKI, MICHAŁ URBANIAK, KRYSTYNA PROŃKO, MOTION TRIO, PROMOE, GRUBSON, RAPSUSKLEI, LESZEK MOŻDŻER and MUM (ICELAND). He was a support on live concerts to TRICKY, PRODIGY, MASSIVE ATTACK, SKUNK ANANSIE, TALIB KWELI, THE VACCINES, WU-TANG CLAN, COLDCUT, and many other world known Artists. is a cycling concert, cycle brass bands parade which joins bikes with brass and big bands culture phenomenon. This year for the first time it will accompany Wroclaw Bike Day creating an 8 kilometers of live concert. All this on June 14th on Wroclaw streets. This combination seems awkward, but has in fact very strong common denominator. Bikes as well as brass instruments feed on natural energy, specifically: force of human muscles. The originator of this unique, one of the first in Europe events is Jan Feat, Danish composer and performer of Polish descent. Project held under Wroclaw ECOC 2016 and NEXTBIKE patronage is going to be a constant element of building international and multilingual orchestra of brass bands - REBEL BABEL ENSEMBLE. We are sharing with you John Feat’s compositions edited by Adam Lepka. If you want to share yours orchestra music with other REBEL BABEL members, please send it to our mail.